Blow the balloon as your first move. 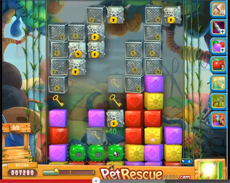 Keep clearing the blocks of the level, ignoring the wired locked blocks that fall above the screen. When you are almost to stay out of moves use the mesh mash booster that gets activated to smash the wires and use the first key, in order to move on. Repeat the same procedure again, as many times as it’s needed to reach the bottom of the screen, but be careful not to release the pets from their pet boxes. Do it only when you will bring and the three pet boxes side by side (otherwise you’ll not complete the level). Clearing the blocks under the pets is not a difficult task.